"Massachusetts, Town Clerk, Vital and Town Records, 1626-2001," database with images, FamilySearch (https://familysearch.org/ark:/61903/1:1:F42Q-3LG : 13 July 2016), Jonathan Lemmon, 04 Mar 1725; citing Birth, Charlestown, Suffolk, Massachusetts, United States, , town clerk offices, Massachusetts; FHL microfilm 740,995. John A. Schutz, Legislators of the Massachusetts General Court, 1691-1780: a biographical dictionary, , at https://books.google.com/books?id=eKPU-Drsc_UC . Boston: Northeastern University Press, (1997) , p. 272. 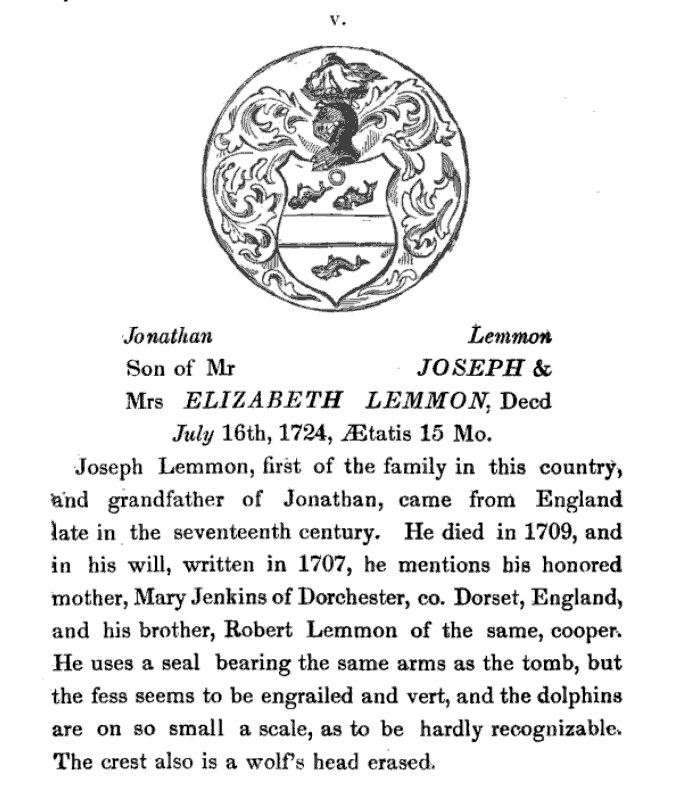 "Massachusetts Births and Christenings, 1639-1915," database, FamilySearch (https://familysearch.org/ark:/61903/1:1:F423-TPX : accessed 15 December 2015), Joseph Lemmon, 05 Feb 1715; citing , v 3 p 166; FHL microfilm 740,995. FamilySearch Pedigree Resource File, , Submitter: Samuel Taylor "Sam" GEER. 1517 Junior Drive Dallas, TX 75208-2423. "Massachusetts, Town Clerk, Vital and Town Records, 1626-2001," database with images, FamilySearch (https://familysearch.org/ark:/61903/1:1:F42Q-SHM : 13 July 2016), Jonathan Lemmon, 18 Apr 1723; citing Birth, Charlestown, Suffolk, Massachusetts, United States, , town clerk offices, Massachusetts; FHL microfilm 740,995. 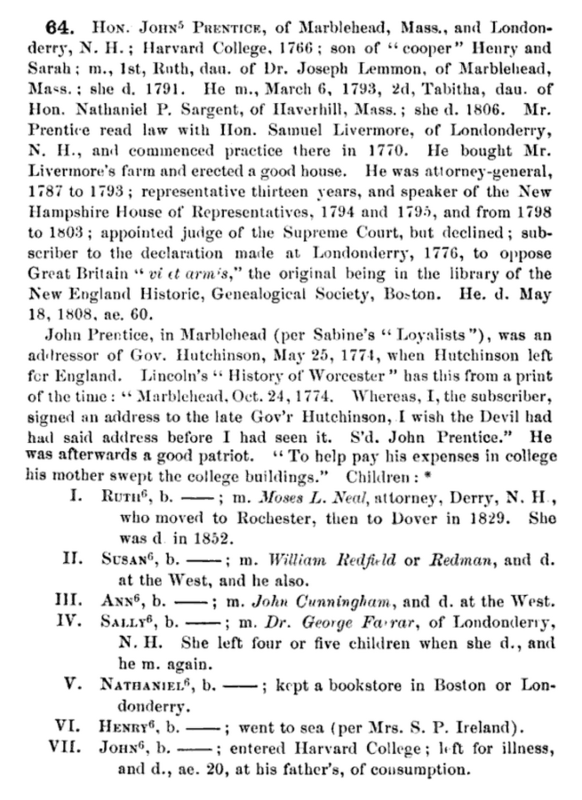 "Massachusetts Births and Christenings, 1639-1915," database, FamilySearch (https://familysearch.org/ark:/61903/1:1:FCPR-LPB : accessed 15 December 2015), Eleazer Lemmon, ; citing , ; FHL microfilm 0837130 IT 2. 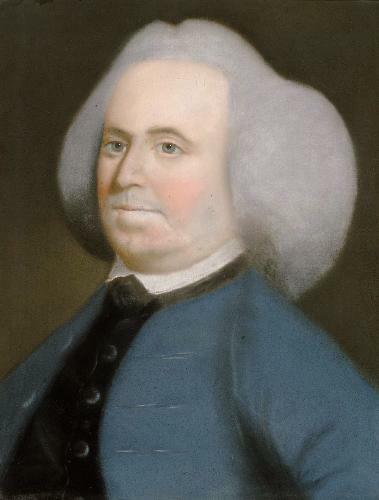 "Massachusetts, Town Clerk, Vital and Town Records, 1626-2001," database with images, FamilySearch (https://familysearch.org/ark:/61903/1:1:F42Q-461 : 13 July 2016), William Lemmon, 29 Jun 1730; citing Birth, Charlestown, Suffolk, Massachusetts, United States, , town clerk offices, Massachusetts; FHL microfilm 740,995. The Heraldic Journal: Recording the Armorial Bearings and Genealogies of American Families, , at https://books.google.com/books?id=NnIFAAAAQAAJ . Boston: Wiggin & Lunt, (1865) , Vol. 1, p. 48. 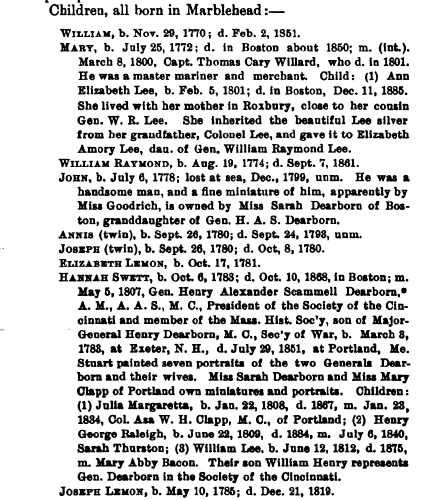 Susan E. Roser, Mayflower Births and Deaths: From the Files of George Ernest Bowman at the Massachusetts Society of Mayflower Descendants, , at http://search.ancestry.com/search/db.aspx?dbid=3718 . Baltimore, Md. : Genealogical Publishing Company, Inc., (1992) , p. 140. 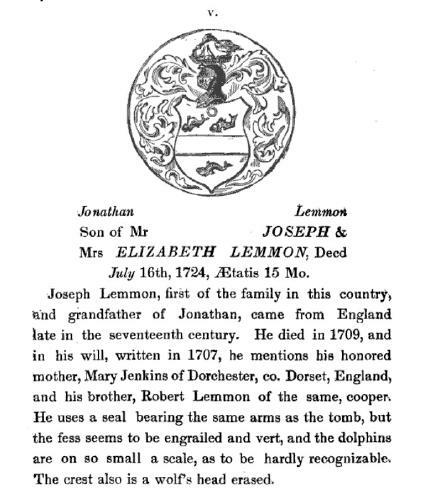 "Massachusetts, Town Clerk, Vital and Town Records, 1626-2001," database with images, FamilySearch (https://familysearch.org/ark:/61903/1:1:F423-TPX : 13 July 2016), Joseph Lemmon, 05 Feb 1715; citing Birth, Charlestown, Suffolk, Massachusetts, United States, , town clerk offices, Massachusetts; FHL microfilm 740,995. Thomas Amory Lee, Colonel William Raymond Lee of the Revolution, , at https://books.google.com/books?id=31wSAAAAYAAJ . Salem, Mass. : The Essex Institute, (1917) , p. 10. Refer to this source for additional biography. Vital Records of Marblehead, Massachusetts to the end of the year 1849, Salem, Mass. : The Essex Institute, (1903) , Vol. 2, p. 417, First Congregational Church records. John Wingate Thornton, Mementos of the Swett Family, Roxbury, Mass. : Privately Printed, (December 1851) , p. 18 Portions of this volume are confusing and misleading. Additional biographical material may be found in this book. Charles James Fox Binney, The History and Genealogy of the Prentice, Or Prentiss Family, in New England, Etc., from 1631 to 1883, , at http://books.google.com/books?id=0EJfQJUmarMC . Boston: Published by the editor, (1883) , p. 62. Horace Edwin Hayden, Alfred Hand and John Woolf Jordan, Genealogical and Family History of the Wyoming and Lackawanna Valleys, Pennsylvania, , at http://books.google.com/books?id=H8c4AQAAMAAJ . New York & Chicago: Lewis Publishing Company, (1906) , Vol. 1, p. 174. 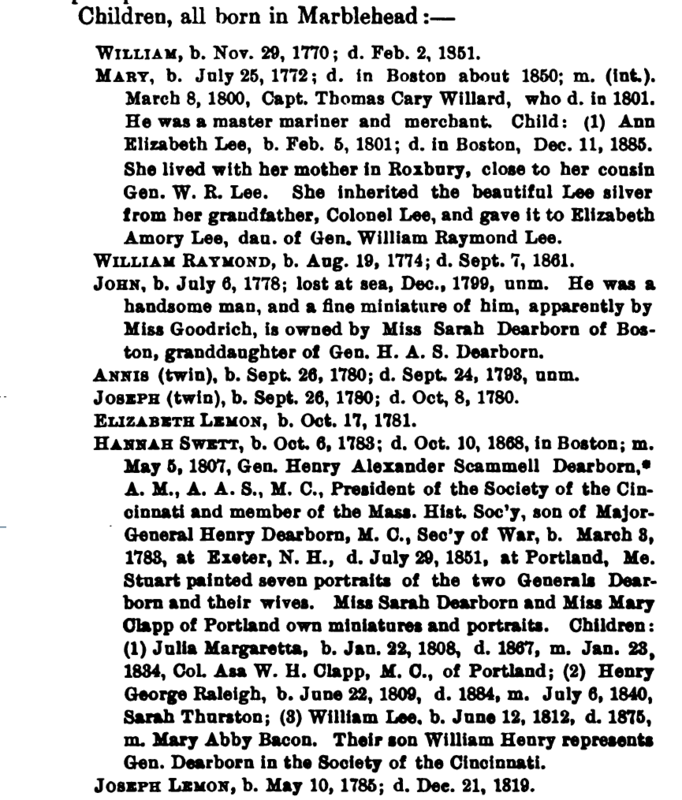 Thomas Amory Lee, "The Lee Family of Marblehead," The Essex Institute Historical Colklections, Vol. LII (1916): p. 258-259. Thomas Amory Lee, Colonel William Raymond Lee of the Revolution, , at https://books.google.com/books?id=31wSAAAAYAAJ . Salem, Mass. : The Essex Institute, (1917) , p. 25. Thomas Amory Lee, Colonel William Raymond Lee of the Revolution, , at https://books.google.com/books?id=31wSAAAAYAAJ . Salem, Mass. : The Essex Institute, (1917) , p. 26. Two block alphabets; letters colored alternately; no "J" or "U." Numbers to 9. 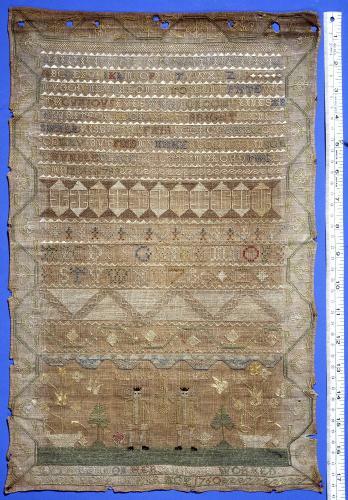 All rows (including verse) separated by wide and narrow crossbands, many satin-stitched sawtooth bands. At base of sampler, spies returning from Canaan (Caleb and Joshua), wearing flared coats, wide hats, and kneebreeches, and carrying bunch of grapes on pole; letters "C" and "I" identify them, and over their heads further notation "NVMBERS C 13 V 23"; flanked by tulip plants in baskets and small trees. Border of geometric vine-and-flower on top and two sides. Silk embroidery thread on linen ground. 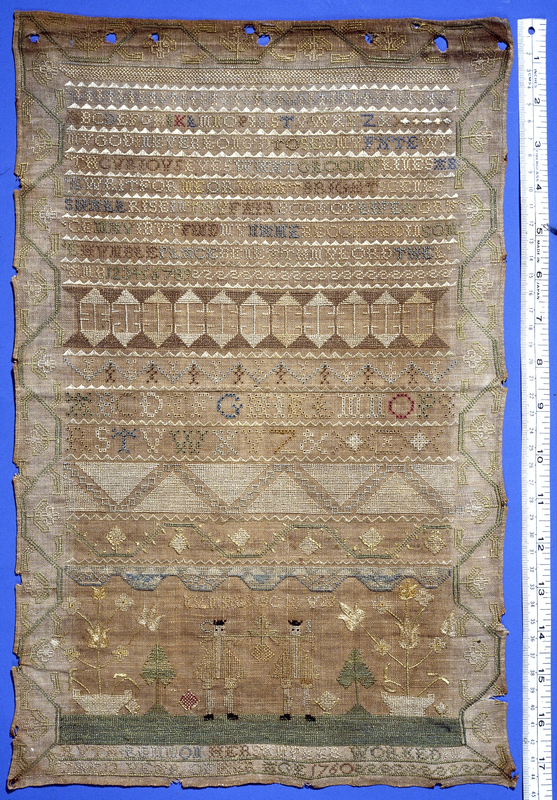 STITCHES: cross, satin, fern, eyelet, outline, stem, straight. THREAD COUNT: warp 50, weft 50/in. THE 13 YEAR OF HER AGE 1760"
Ruth was born on December 27, 1747, to Joseph and Hannah Lemmon in Marblehead, Massachusetts. She married John D. Prentice on January 11, 1770, in Marblehead, and they had one daughter, Ruth, born in 1770. Later they moved to Londonderry, New Hampshire, where her husband was a lawyer and New Hampshire Attorney General from 1787 to 1793. Mrs. Prentice died in 1791 in New Hampshire, and John married Tabitha Sargent in 1793. Vital Records of Marblehead, Massachusetts to the end of the year 1849, Salem, Mass. : The Essex Institute, (1903) , p. 318. Vital Records of Marblehead, Massachusetts to the end of the year 1849, Salem, Mass. : The Essex Institute, (1903) , p. 343. Record added: Mar 27, 2007. Record added: Jan 30, 2008. Record added: Nov 10, 2009. Cuyler Reynolds, Hudson-Mohawk Genealogical and Family Memoirs, New York: Lewis Historical Publishing Company, (1911) , Vol. 2, p. 596, which gives the surname as "Leister." Daughters of the American Revolution., Lineage book / National Society of the Daughters of the American Revolution, Washington, D. C.: The Society, (1896-) , Vol. 1, p. 218. Cuyler Reynolds, Hudson-Mohawk Genealogical and Family Memoirs, New York: Lewis Historical Publishing Company, (1911) , Vol. 2, p. 596. New York: Albany County Deeds, , Vol. 7, p. 3724. Sarah Letheridge was born perhaps about 1718. 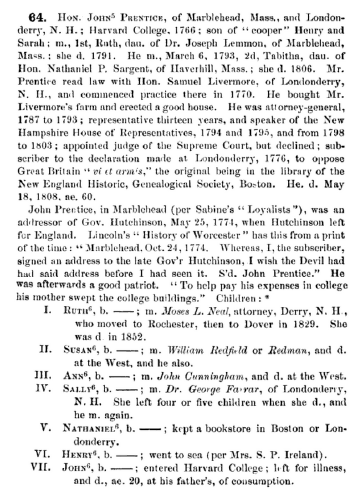 Henry Bond, Genealogies of the Families and Descendants of the Early Settlers of Watertown, Massachusetts, , at https://books.google.com/books?id=_oc6AQAAIAAJ . Boston: Little,Brown & Company, (1855) , Vol. 2, p. 968. 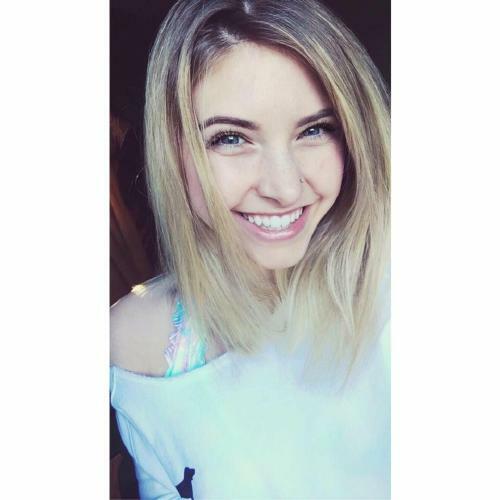 She is the daughter of James G. Levine and Adrienne Lee Trager. Went to Pelham High School. Ashleigh Levine was born perhaps about 2000. She is the daughter of Marc David Levine and Erin E. Muldoon. 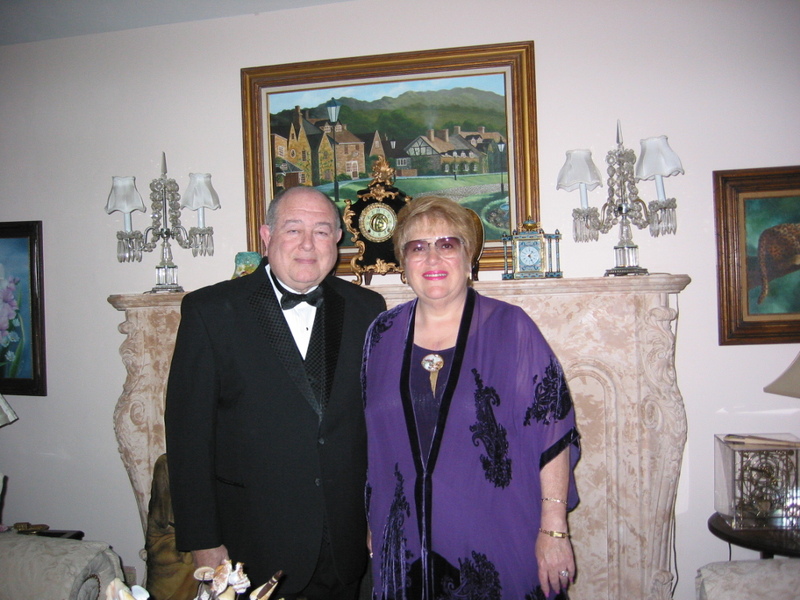 She is the daughter of Samuel H. Levine (born --- Sloffkie) and Rose Berger. 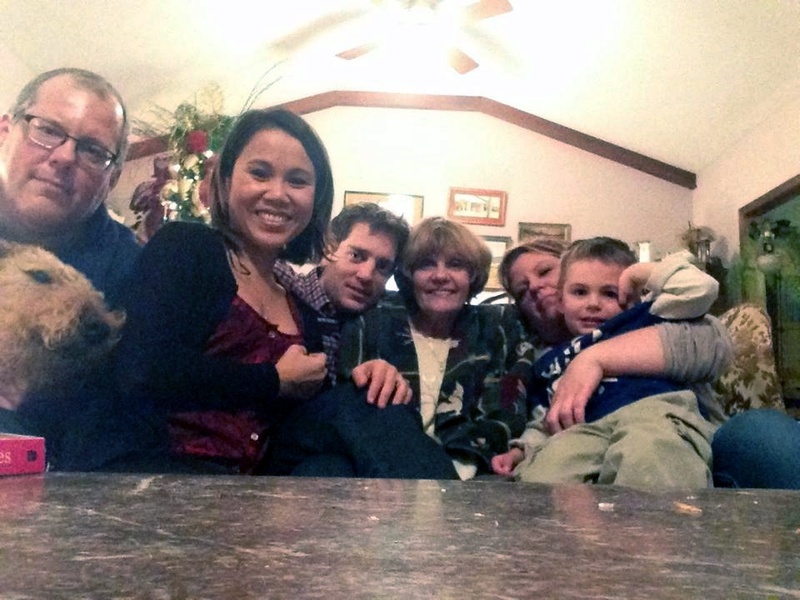 Benjamin David Levine is the son of Lawrence Roys Levine and Sally Ann Hedgpeth. 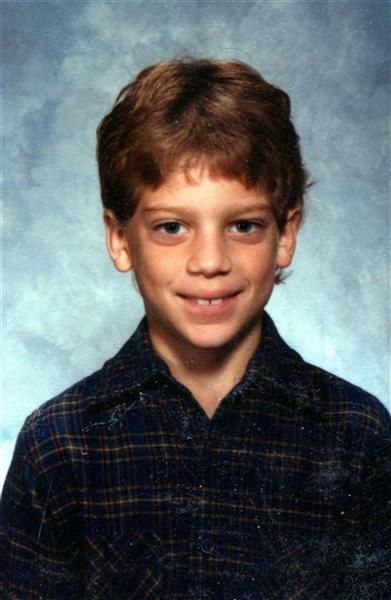 Benjamin David Levine lived with Lawrence Roys Levine and Sally Ann Hedgpeth from 1979 to 1993 at 1125 E Cantebury, Springfield, Greene County, Missouri. 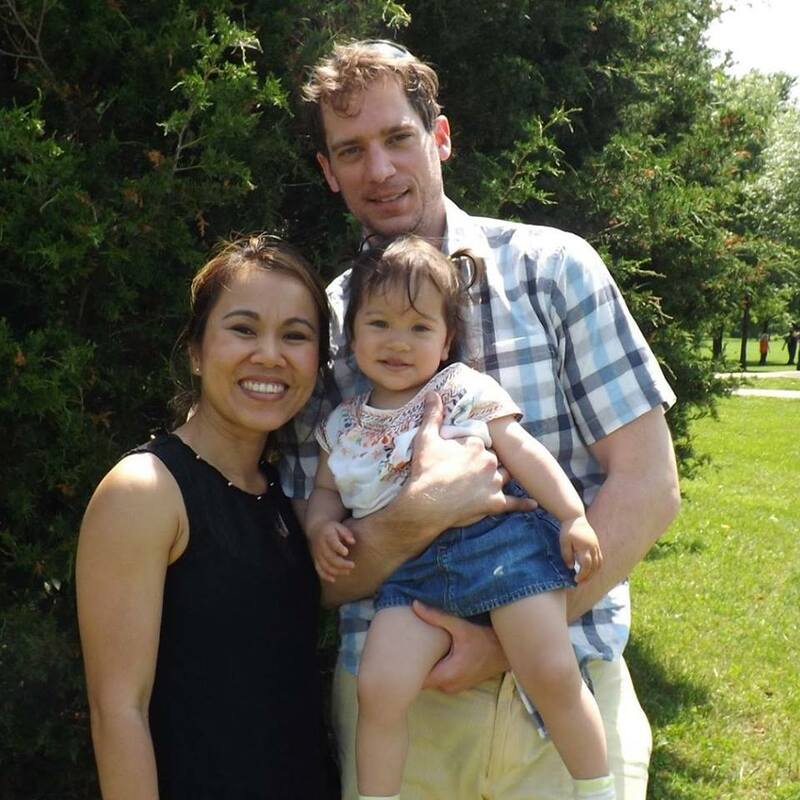 Benjamin David Levine was graduated in 1995 from Kickapoo High School, and was graduated from Missouri State University in 1999, with a degree in biology. 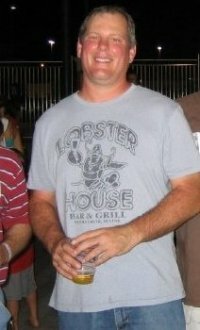 He earned his PhD in molecular biology at the University of Missouri in 2007. Benjamin married Phatcharee "Pattie" Lueyot on May 5, 2011. 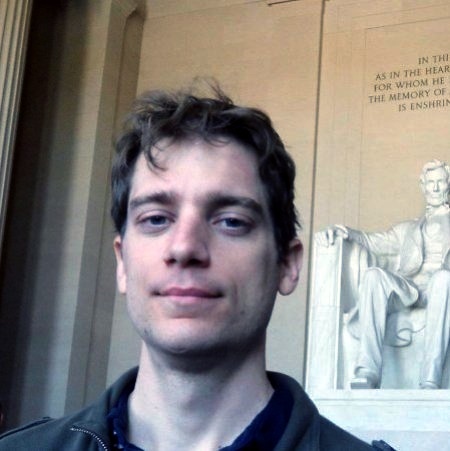 Benjamin David Levine is online at https://www.facebook.com/ben.levine.58. Bradley Joseph Levine lived with Lawrence Roys Levine and Sally Ann Levine from 1971 to 1972 at 409 Victoria Place, Toledo, Lucas County, Ohio. Bradley Joseph Levine is the son of Lawrence Roys Levine and Sally Ann Hedgpeth. Bradley Joseph Levine lived with Lawrence Roys Levine and Sally Ann Hedgpeth in 1973 at 410 W Alexis Rd, Toledo, Lucas County, Ohio. Bradley Joseph Levine lived with Lawrence Roys Levine and Sally Ann Hedgpeth from 1974 to 1977 at 2536 Robinwood Ave, Toledo, Lucas County, Ohio. 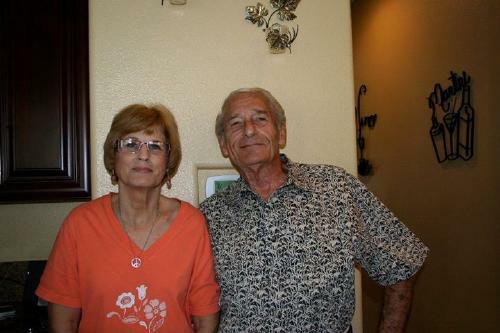 Bradley Joseph Levine lived with Lawrence Roys Levine and Sally Ann Hedgpeth from 1979 to 1993 at 1125 E Cantebury, Springfield, Greene County, Missouri. 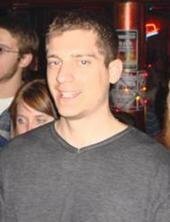 Bradley Joseph Levine is online at https://www.facebook.com/bradjlevine.